Until recently, all photosynthetic eukaryotes were considered members of the kingdom Plantae. The brown, red, and gold algae, however, have been reassigned to the Protista kingdom. This is because apart from their ability to capture light energy and fix CO2, they lack many structural and biochemical traits that distinguish plants from protists. The position of green algae is more ambiguous. Green algae contain the same carotenoids and chlorophyll a and b as land plants, whereas other algae have different accessory pigments and types of chlorophyll molecules in addition to chlorophyll a. Both green algae and land plants also store carbohydrates as starch. Cells in green algae divide along cell plates called phragmoplasts, and their cell walls are layered in the same manner as the cell walls of embryophytes. Consequently, land plants and closely related green algae are now part of a new monophyletic group called Streptophyta. The remaining green algae, which belong to a group called Chlorophyta, include more than 7000 different species that live in fresh or brackish water, in seawater, or in snow patches. A few green algae even survive on soil, provided it is covered by a thin film of moisture in which they can live. Periodic dry spells provide a selective advantage to algae that can survive water stress. Some green algae may already be familiar, in particular Spirogyra and desmids. Their cells contain chloroplasts that display a dizzying variety of shapes, and their cell walls contain cellulose, as do land plants. Some green algae are single cells, such as Chlorella and Chlamydomonas, which adds to the ambiguity of green algae classification, because plants are multicellular. Other algae, like Ulva (commonly called sea lettuce), form colonies ([link]). Green algae reproduce both asexually, by fragmentation or dispersal of spores, or sexually, by producing gametes that fuse during fertilization. In a single-celled organism such as Chlamydomonas, there is no mitosis after fertilization. In the multicellular Ulva, a sporophyte grows by mitosis after fertilization. Both Chlamydomonas and Ulva produce flagellated gametes. 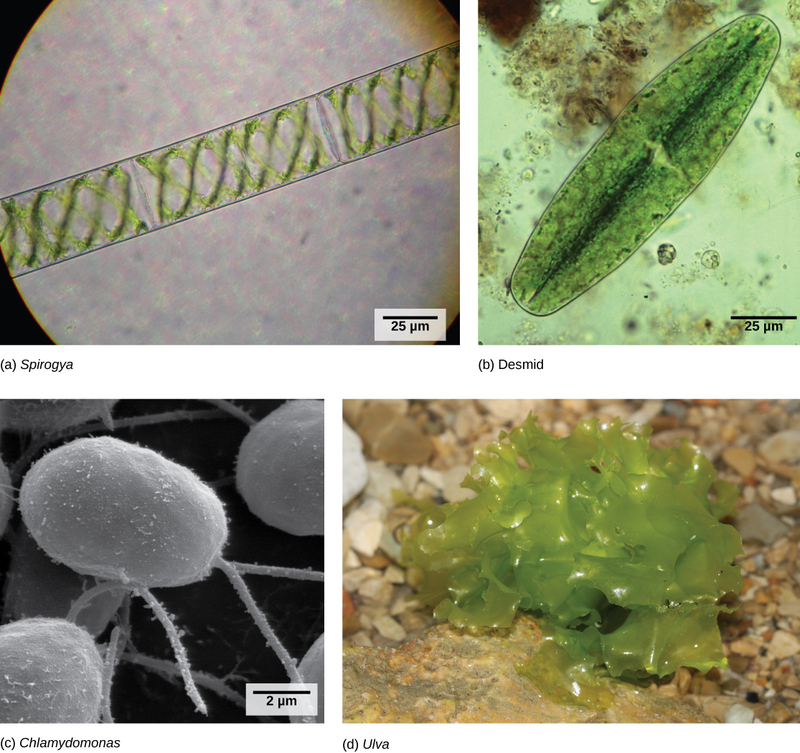 Green algae in the order Charales, and the coleochaetes (microscopic green algae that enclose their spores in sporopollenin), are considered the closest living relatives of embryophytes. The Charales can be traced back 420 million years. They live in a range of fresh water habitats and vary in size from a few millimeters to a meter in length. The representative species is Chara ([link]), often called muskgrass or skunkweed because of its unpleasant smell. Large cells form the thallus: the main stem of the alga. Branches arising from the nodes are made of smaller cells. Male and female reproductive structures are found on the nodes, and the sperm have flagella. Unlike land plants, Charales do not undergo alternation of generations in their lifecycle. Charales exhibit a number of traits that are significant in their adaptation to land life. They produce the compounds lignin and sporopollenin, and form plasmodesmata that connect the cytoplasm of adjacent cells. The egg, and later, the zygote, form in a protected chamber on the parent plant. What characteristic of Charales would enable them to survive a dry spell? Which one of these characteristics is present in land plants and not in Charales? 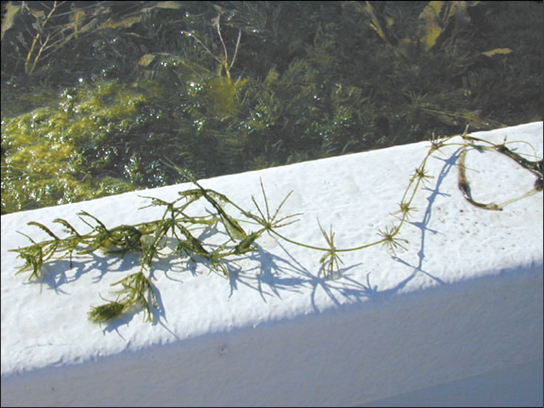 To an alga, what is the main advantage of producing drought-resistant structures? It allows for survival through periodic droughts and colonization of environments where the supply of water fluctuates. Green Algae: Precursors of Land Plants by OpenStaxCollege is licensed under a Creative Commons Attribution 4.0 International License, except where otherwise noted.